"TRD's work on high-performance off-road variants of Toyota vehicles goes back a number of years," said Keith Dahl, Toyota's national manager of engagement marketing and motorsports. "The FJ-S is a great example of their off-road expertise." TRD went further than unusual to make sure the FJ-S was up to the most serious overland terrain, starting by upgrading the chassis and body structure for more grueling off-road duty. The designers used an underbody "exoskeleton,” to build in added stiffness and strength, thereby creating a stronger platform for modified suspension upgrades plus wheel and tire enhancements. The front suspension takes full advantage of 60-mm Bilstein racing shocks with a 1.3-inch lift, and sports 50-mm Bilstein racing shocks with remote reservoirs at the rear. The TRD FJ-S Cruiser looks ready for the Baja in its tough 17-inch TRD Midnight Black beadlock-style wheels and BFGoodrich All-Terrain tires, completing the FJ-S go-anywhere expertise. The FJ's 4-liter V6 engine gets the full TRD supercharger treatment with a Twin Vortex System (TVS) and a large air-to-water intercooler. The net effect is a 30 percent boost in horsepower to 345 hp, and a torque peak of 340 lb.-ft at 3,500 rpm, a 25 percent improvement, as well. A custom cat-back exhaust gives auditory evidence of the FJ's enhanced offroad DNA. The exterior of the FJ-S sports an attractive front nudge bar and rock rails, while the interior gets two-tone leather seats with FJ-S logos on the backs and custom floor mats. 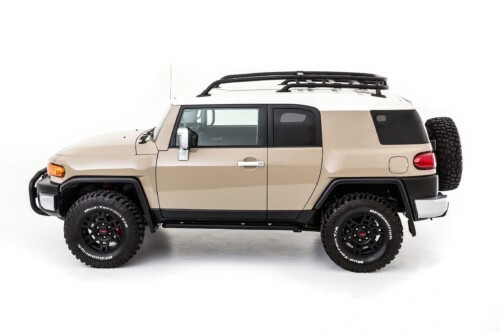 Fittingly the FJ Cruiser was first introduced as a concept just about 10 years ago as a retro SUV invoking the DNA of the former FJ40 Land Cruiser. It was one of the early challengers to Jeep’s mastery of the offroad enthusiasts’ vehicle. The FJ-S will be on display along with eight other new and unique custom-built Toyota vehicles in the Toyota display booth #24801 in Central Hall at the 2012 SEMA Show starting next week.